Who says you have to have a lot of money to brighten your life? Spray paint will do it. Here are a couple of examples. 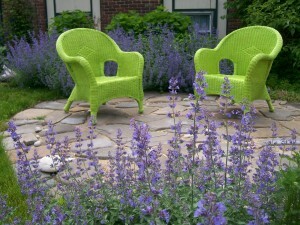 My niece Lori and her best bud Mike recently decided to jazz up some cheap white plastic-ish outdoor chairs. The before and after photos tell the tale. Whatever you do with your spray paint, be safe. Have fun. I painted a couple of old, beat-up wicker chairs a few years back and they are kinda cute in the front yard (that I no longer own.) But it’s fun to do and to look at. Do it. 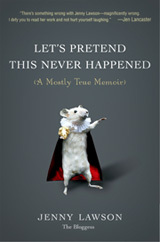 I have a huge girl crush on The Bloggess (thebloggess.com), aka Jenny Lawson. I want to be her best friend. Her writing makes me laugh out loud, so she’s my go-to blues buster. This is one of those rare laugh-out-loud books. Go read it. Went to see her in Chicago Saturday. She was there for a book tour. We bonded. She took a video of me that she promised would go up on her blog soon. Well, when I say “we” bonded, I mean me and the hundreds of other people in the audience. And, yeah, the video was a quick pan of the crowd. But I WAS in the first row and asked a question. We made eye contact. And I could see in her eyes that she agreed that we should be best friends. If you ever need a push to take action and get yourself out of a funk, read her Red Dress story. It caused me to immediately write a hilarious blog post of my own (not this one, which you’ll notice, isn’t hilarious).Then go buy her book, “Let’s Pretend This Never Happened.” And then bookmark her blog. Because I’m sure my picture will be included in it one day soon.